Also known as Flower Beds in Holland, Bulb Fields is an oil painting that was created by Vincent Van Gogh during 1883, his second year of stay in The Hague. It was his very first garden painting. "Ever since I moved to Canada I've wanted to have a painting that reminds me of my home country. This Dutch scenery by Van Gogh reminds me of my fantasic childhood in Holland. 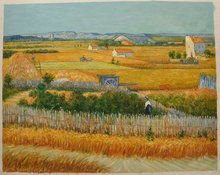 Thank you so much, Jesse"
The panoramic view of the field with its colorful spring flowers captured in this unique painting of Van Gogh, “The Bulb Fields,” has been exactly replicated in our reproduction of the painting. 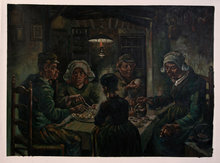 The artists we have picked for the purpose, are some of the best in Holland and the rest of the world, who have taken time to study the unique techniques of Van Gogh and understand his perspective before creating the masterpieces that we have put up on our website. After being refused by his widowed cousin, Cornelia “Kee” Vostricker, to whom Van Gogh proposed, he left to The Hague so as to sell his paintings. There he met Anton Mauve, who was his cousin by marriage. Mauve was a successful artist in The Hague back then. 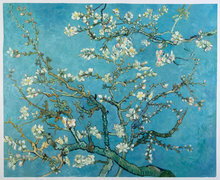 He took Van Gogh as his student and introduced him to watercolors. He did learn a lot of techniques from Mauve. 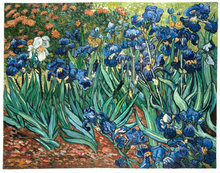 Mauve even helped him in establishing his own studio at The Hague and lent him some money to buy furniture. He also introduced him to the most important art society of The Hague, the Pulchri Studio, where Mauve himself played an important role. Working alongside Mauve’s instructions, Van Gogh soon changed over to oil paintings and used them liberally on his canvas. He was amazed at the kind of results he produced. However, very soon his acquaintance with Mauve came to an end due to reasons. Bulb Fields is one of Van Gogh’s early attempts on landscape paintings. 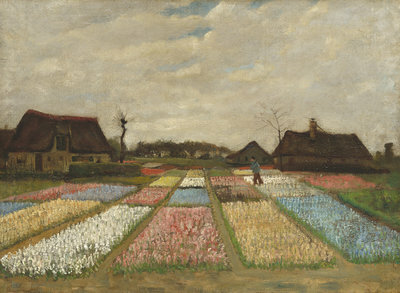 This was a luminous view of tulip fields in blossom that he captured during his second year in The Hague. You can see that he has observed the foreground of this composition from a low position. Ever since I moved to Canada I've wanted to have a painting that reminds me of my home country. 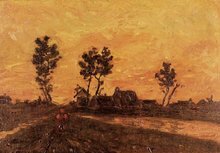 This Dutch scenery by Van Gogh reminds me of my fantasic childhood in Holland.